Meg had a Hawaiian themed birthday to go to this weekend and I hunted around and found the perfect stamp from Lizzie Anne (kind of a LA swan song I guess since they're closing their doors). Yes, the card is bright but I was going for bright. I'm not one to usually go for colors like this but this occasion was a perfect chance for me. The hula girl is from Lizzie Anne and colored with copic markers. The sentiment is from my trusty supply of Papertrey stamps. And if I can do this, I can do the color challenge for the Papertrey summer card camp, right? I haven't tackled the Monday challenge - have you? If so, leave me a link and I'll come visit. I am taking a whole new direction today from card topic to color scheme so let's just dive right in, shall we? I joined the Lizzie Anne monthly mix club so I've been using more of their fun stamps, which is what this one is. I decided to stamp it on the strong color so I could just us the line image rather than coloring in. I used Memento tuxedo ink for the image and sentiment. Since I was going truck, I decided I wanted something a little more rugged for the background. Want to guess which company this embossing folder is from? Yep, Tim Holtz. You know I'm not a grungy sort of girt but I'm no good at saying no to embossing folders so I'm thrilled to get a chance to use some of his. I embossed the cardstock with the folder first and then dry brushed it with black acrylic paint. I've always liked this type of background for all sorts of styles of cards. Depending on the embossed image and the colors used, it can be boyish and grungy or elegant and pretty, with everything in between. The black stripe of cardstock is actually embossed too although that may be hard to see in the picture. I used one of Stampin' Up's folders for that. Phew, I've have a busy week of stamping and blogging so I'm taking Sunday off. I'll be back again on Monday. Hope your weekend is a great one! Recently my mom and I went to a wedding shower and this is the one my mom ended up giving. I didn't know the color scheme so I went with the pink and brown....my go to color when I want to make wedding stuff. I'm not sure why I always go with that but it's one of my favorite color combo's so I guessing that's why. This is a fun stamp from Lizzie Anne Designs. It's stamped with rose red ink (Stampin' Up) and cut out with a nestie's die. The flower embossed layer really ties in nicely since the flowers are very similar looking. I'm not sure which company the folder is from. So many are coming out now that I lose track, although I can categorically say that it is not Tim Holtz.....there is no grunge factor to those flowers! I'm taking a break from my red and white stamping today. Since the World cup has been on, I thought I'd ink up this little soccer boy from Lizzie Anne stamps. He is inked with Memento tuxedo ink and colored with copic markers. (and if I could find the sheet with the marker info, I would tell you which ones I used!). The sentiment is from Papertrey (really, who else do I use for sentiments???) and inked with Memento paris dusk ink. Tomorrow I will be back again with more red and white. Have a great night! I finally got a chance to sit down and work on this week's Splitcoast CAS challenge. The challenge was to use something sparkly on your card. So I made a quickie 4th of July card. This is a new stamp I got recently from Lizzie Anne Designs and I thought the sparkler idea was perfect for this challenge. The image and sentiment is all one stamp and is stamped with palette noir ink. Then I took my red and my blue spica pens (the first bit of sparkle) and "colored" the sparklers. Then I used red and blue Taylor's Twinkles from Taylored Expressions for the centers of the sparklers. I also made some with Stickles in the center for variety as well. A quick and easy 5 minute card with a bit of sparkle all set for the holiday. And that's all the time I have today. We're off to a barbeque shortly and hoping the weather improves. Yet more rain last night and today has sidelined us a bit. I am on a roll with Splitcoast challenges. Okay, so they are never the challenge of the day but hey, I'm working on them. Last weeks Ways to Use It challenge was stripes. Now I love striped patterned paper so I knew that would figure into the challenge. I had a few different choices of paper picked out but then little Elzybell called out to me and she won out. I had decided to ink up this little girl about the same time as the challenge rolled around and thought why not paper piece her dress with stripes? I went through a couple of choices of paper but settled on this great orange and pink color combo. The image is obviously from Elzybell's and the sentiment is from Lizzie Anne. Does the sentiment look familiar? I used it in another form on my one button card. I probably have this sentiment in 10 shapes/sizes/designs. Elzy is colored with copic markers except for her hair. That I colored with a prismacolor pencil and blended with baby oil. I used a gelly roll metallic pen for her shoes and hairbow for a little sparkle. Its a fairly simple design but one I like to play around with. This paper is so pretty in person that I figured you needed to see a lot of it. I've looked at today's sketch challenge and have a few thoughts. I'm sure some time next week you'll see the fruits of my labor. Have a great day! I have a lot of Santa stamps (okay, I have a lot of stamps in general but I DO have a lot of Santa stamps). And many of those poor Santas have yet to see ink. Today I decided to get one of them dirty. I think with tomorrow's release of new Papertrey stamps, I'm subconsciously reaching for uninked PTI stamps so I don't feel guilty about buying tomorrow. Those sneak peeks have completely won me over - there will be new PTI stamps in the house before too long. In general terms, this card is inspired by a card I saw over at Splitcoast but that one featured a snowman rather than Santa. Santa is colored with a copic marker and his fringe is "colored" with "snow" from Plaid/Deco Art. He is pop dotted over the ribbon - I find I really like the slight dimension that pop dots give me without making the card too bulky. And i use the term pop dots loosely. I actually use foam mounting tape that I cut into however many pieces I need/want for whatever I'm adding dimension to. A large roll goes a long way and I use it a LOT. The sentiment is from Lizzie Anne and is stamped in burgundy (Stampin' Up). The kids are back to school today and now I need to finalize details for Meg's Halloween party this weekend. Thanks for the suggestions I have received - I appreciate the help! Happy October! We started off with an awful thunderstorm but the sky has cleared and now we have some gorgeous autumn weather, exactly what October should be. Thoughts of Halloween have infiltrated our house quite thoroughly. The kids already have their costumes and they are anticipating the holiday with excitement. This year we thought Meg was old enough to have a Halloween party. I'm keeping it small (only about 7 girls) basically for my sanity and to test the waters, so to speak. I played around with the invitation design until FINALLY both Meg and I were satisfied. This is probably the most layers I have ever used on a card (ten, yikes!) but I'm really happy with the final result. The witch is from Lizzie Anne Designs and she is colored with prismacolor and copic markers. The scroll and sentiment are from Papertrey Ink and the little tiny spider is from Doodlebug. And I finally got to use my spiderweb cuttlebug folder. The grey layer is actually metallic silver cardstock and there is also a bit of sparkle in the witch using a gold spica pen. Meg was really happy with them so that's what counts for me. Now its on to ideas for the party itself. I have some things milling around in my head but if you have any suggestions for 7 year old girls, I'd be happy to hear them! I will admit it, I have been totally overwhelmed by my schedule lately. I haven't been crafting and feel like I'm overbooked. And don't even get me started on the state of my weekends!! Ah well, it'll calm down eventually. All I ask is for a little balance rather than all the events happening at the same time. This is the card I made for my craft fair but originally forgot to take a picture of. I sold that but this one is part of the second batch. 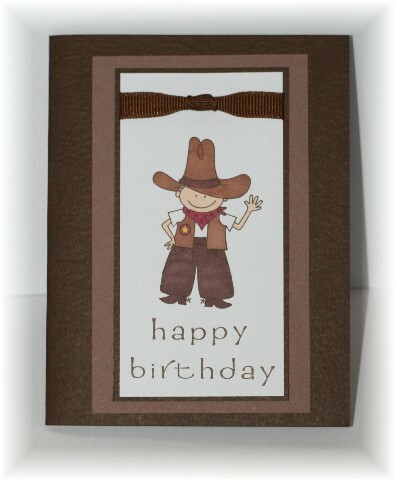 This cute little cowboy is from Lizzie Anne and he is colored with prismacolor markers. The sentiment is from TAC. It's a long stamp but I ended up lining it up one word under the other by masking off the word I didn't need when stamping. Other than that, he's pretty simple. I've been having some problems with my back lately so I'm making this short and sweet. My computer chair and back don't really get along too well. Have a great night!